Harriers are a charismatic group of birds of prey with a worldwide distribution that have long fascinated bird watchers and scientists. Here for the first time the biology of the world's harriers is treated within one cover, in readily accessible language. There are detailed comparisons of northern and southern species, descriptions of mating systems and population dynamics life histories, and insights into the selection pressures shaping the birds' life histories. The author addresses such questions as how females choose partners against their apparent self- interest, how they adjust to prevailing circumstances to produce the optimal clutch size, and what underlies variations in size dimorphism and copulation patterns. New information resulting from a DNA examination of the group reveals three new harrier species and allows construction of a new phylogeny of the harriers. The book is brought to life by fine original line drawings of these impressive birds by the author's twin brother. It will be a treat for all raptor biologists, amateur raptophiles, and behavioural ecologists interested in temperate-tropical comparisons. 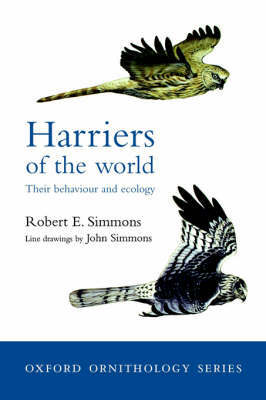 ... the book is remarkably compact, written in an engaging and easily accessible style, and features many beautiful line drawings by the authors twin brother, John ... We recommend that everyone with even a passing interest in how and why birds do what they do, as well as all those who take study of behaviour, ecology and evolution more seriously, should add this volume to their bookshelves.